In February of 1952 Clint Murchison, Jr. purchased Spanish Cay, an uninhabited island lying in the northern reaches of the Bahamas, and set about developing it as a retreat for his personal use and enjoyment. Overall his span of ownership exceeded 30 years. It was a place unlike any other, frequented solely by a select group of people of his own choosing - family, friends, and business associates. 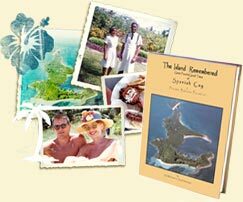 From the outset, the cornerstone of the Spanish Cay experience was the delicious food and drink prepared and served by the Bahamian husband and wife team, Willard and Beryl Hutchison. The recipes they used, which have been so graciously provided by Beryl, are compiled in The Island Remembered. The Murchison family will be forever grateful for her generous assistance and for her open and loving spirit. However this volume is more than just a cookbook. It has been written and illustrated to provide the reader with a brief history of the Island under Clint, Jr.'s ownership as well as to offer some insight into its allure. A visit to the Island was an experience like none other. It was truly unique and will always remain vivid in the hearts and minds of those fortunate enough to have lived it.